I came to London when I was four years old. 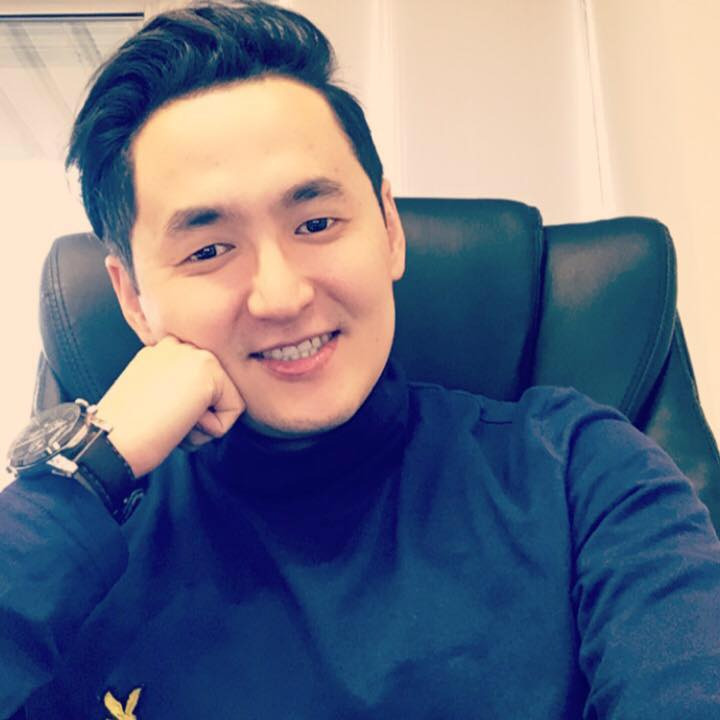 I maintain the connection with Kazakhstan mainly through social networks. At home, we have access to Kazakh TV channels such as Caspionet and Kazakh TV to watch the news. I speak Kazakh fluently. I learned Kazakh in London at the Embassy of Kazakhstan about ten years ago. We had the lessons of the day on Saturdays. I attended these lessons for two years, and then from 2010 to 2012 I went to Almaty and worked there for 2 years. Our ancestors were real nomads, and they migrated from Semey region of Kazakhstan to China in the 1930s during the Russian revolution and then fled from the Chinese regime on foot through the Himalayan mountains to India. They stayed in India for about 10 years but in 1953 the Turkish government offered land for two thousand Kazakh migrants to settle in Turkey and become farmers. I was born in Turkey, and then in the late 1980s, when many Turks began to move to Europe to work, my parents and many Kazakh migrants began to move to Europe. My parents came to London via Germany in 1986. There is an e-book about the mass migration of the Kazakhs — «Exodus of the Kazakhs» written by the author Godfrey Lias. We still keep all Kazakh traditions, for example, and we cook Kazakh national dishes. My mother cooks Nauryz kozhe, baursaks, beshbarmak with beef, without kazy because we can't find it in the UK. And we have many traditional Kazakh items in the living room as kamcha, dombra, chapan, skullcap. We celebrate Kazakh national holidays: Ayt, Nauryz. At home, we speak Kazakh, English and Turkish. The language barrier between Kazakh diasporas and Kazakhs is we cannot speak Russian. And most of the Kazakh diasporas speak Turkish or another European language, sometimes for them difficult to communicate if the other person cannot speak Kazakh or English. But I know that many Kazakhs are now beginning to speak the Kazakh language, especially the younger generation. In the UK there is a Kazakh diaspora. It includes about 40 Kazakh families, and about 200 people in total, including children. 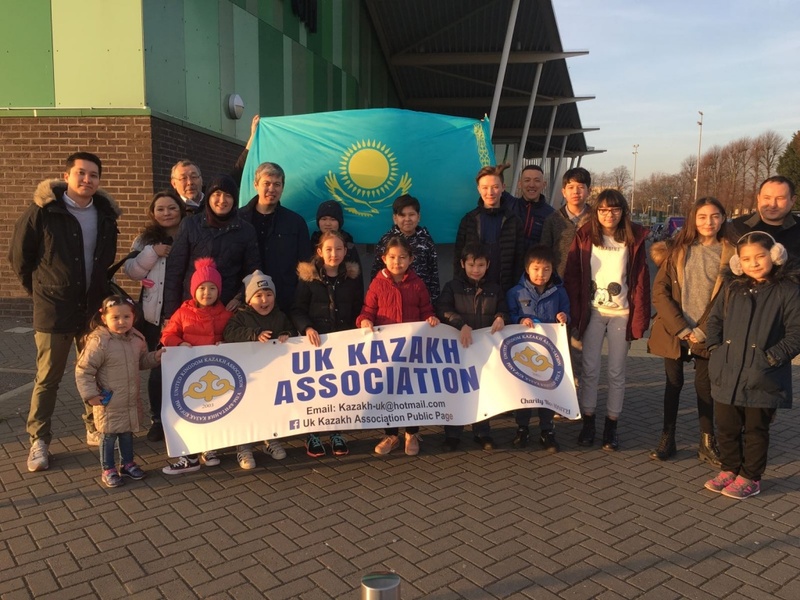 We have a community of the Kazakh diaspora, called the Association of Kazakhs of Great Britain, where we organize events for the Kazakh community. During the national holidays of Kazakhstan, we rent a hall and gather to celebrate together. 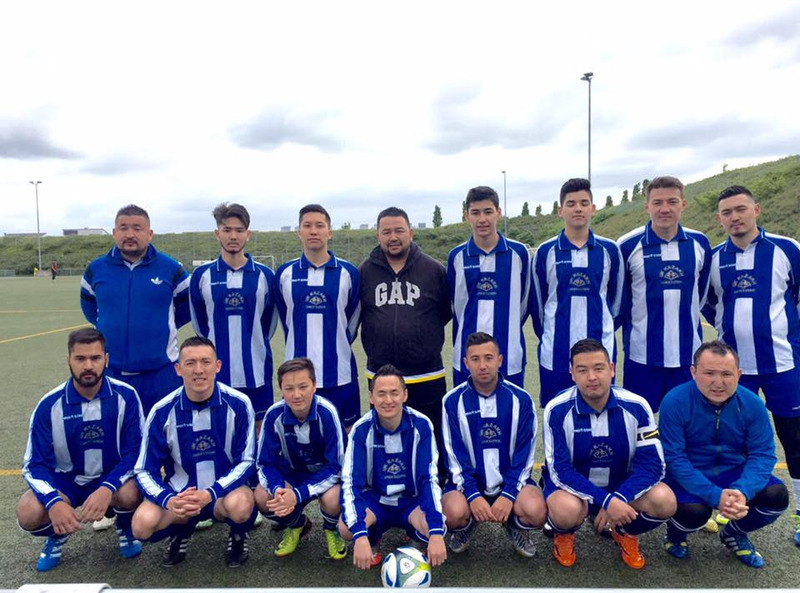 We have a football team of Kazakhs from the UK, and we compete with other European Kazakh teams once a year at a football tournament. Every year it is held in different cities, this year the tournament will be held in Munich, Germany. Speaking about Kazakhstan, I imagine our relatives, endless steppes, such memories warm the soul. I miss Kazakhstan. This native land of our ancestors. Our parents told us that in the 1940s the Kazakhs moved through Tibet to Pakistan and farther to Turkey. My family moved from Turkey to Sweden in 1976, when I was 5 years old. 65 Kazakh families live in our small town. We have a society of Kazakh culture, where I was elected as Chairman. Kazakhs are living in many European countries. And I head the Federation of the Kazakh community in Europe. More than 100 Kazakh families live in Sweden. Our ancestors moved here long ago and we are considered ethnic Kazakhs. Here we work well as lawyers, doctors, teachers, engineers. I have my own firm, we are engaged in the construction of houses. On Nauryz we unite with other nationalities and celebrate. More than 30,000 people gathering together. On stage, the guys in traditional Kazakh costumes dance Kara zhorga, sing national songs. Many are surprised by the beauty of our nation, interested in traditions. We communicate well with each other, and we invite Kazakhs to weddings. Our parents say that Kazakhs should marry only Kazakhs. When our ancestors moved from Kazakhstan, they did not know how Kazakhs lived there. And to save blood and the nation, we were told that we should choose only Kazakhs. My wife's name is Aisha, and we have four children. We try to keep traditions and share them with children. We are going teaching them the Kazakh language. We had neither book nor teachers. Only due to our parents we remember the Kazakh language and trying not to forget about national traditions. Kazakhs from Turkey, Sweden and France often gather. Every year, we gather in Munich at a great Kurultai. Come adults and young, all get acquainted, sing together, communicate. 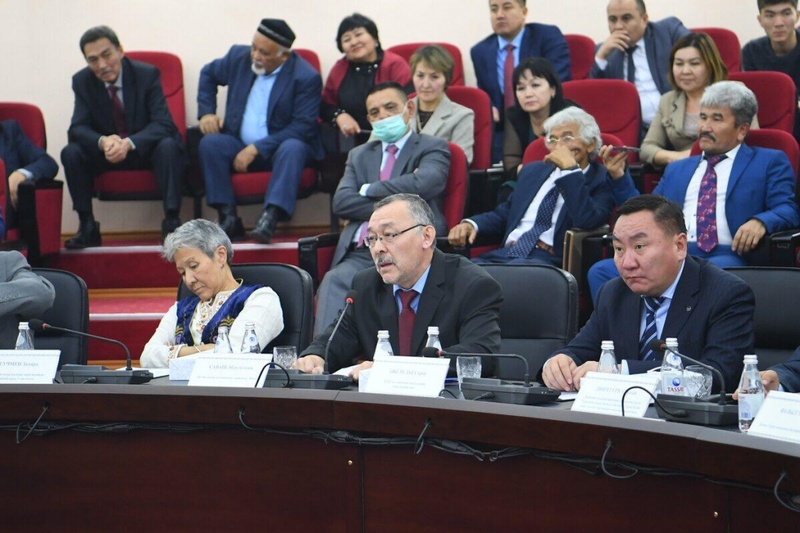 This meeting is necessary to consolidate good relations between ethnic Kazakhs. Now many Kazakh communities in Germany, Denmark, Norway. To unite all Kazakhs and maintenance of the culture, we have created a Federation of Kazakh communities. A month ago held a big Kazakh wedding where ethnic Kazakhs from all countries were invited. Our fathers moved from the Ural, Tarbagatai in 1935 to China. Then they moved from there through the Himalayans to India, where they were helped by local Muslims. My father told me about 20,000 Kazakhs moved there. Then, after the Kazakhs had written a letter to the Turkish Embassy in 1950, they moved to Turkey. I was born and raised in Turkey. There we learned to speak Kazakh a little, went to school. My parents spoke Kazakh at home. The government gave us a house, land, we brought cattle, sowed grain. When I was in high school, my father used to make leather gloves and sell them at the market. In childhood, we all helped parents. After eighth grade, I moved to Istanbul to earn money. And in 1960, many Turks went to Germany and were invited to work there. Among them were our brothers Kazakhs. After the Kazakhs had begun to move to Europe, my brother invited me to move to London. There were a lot of job vacancies. I moved to London in 1979, starting with a job where I had to wash dishes, bring food, serve. I learned how to cook and in 1992 I bought a restaurant. Our family and children worked in this restaurant. I moved my family from Turkey to London. Now I have five children and seven grandchildren. I want them not to forget their roots and language. Before Kazakhstan's independence, we were often called Chinese and we did not like it. We have always been proud we are Kazakhs. In the future, our grandchildren will be leaders. And we will strive to ensure they proudly raise the flag of Kazakhstan. My wife and I speak Kazakh. Previously, when the Kazakh alphabet was written in Cyrillic, it was difficult for us. Now we find films on YouTube in the Kazakh language and show them to children. Previously, the Kazakhs who moved to England spoke in Russian. Now I notice young people speak Kazakh more and more. We have about 40 families who have moved from Turkey. Many of those who came from Kazakhstan on the program Bolashak or moved to work. Together we are gathering for Oraza Ayt and Kurban Ayt. We send invitations on the internet and invite everyone. On weekends we invite guests to our home, serve tea, baursaks, someone plays dombra. Many of our relatives live in Turkey, so we held many weddings there. Conducted kudalyk. Everyone here knows that adults should be respected, and they sit on the honoured place at the table. We take the blessing from the elders. At home, we cook shelpek and baursaks, beshbarmak. Here difficult to find horse meat and lamb meat. It happens that we receive gifts from Kazakhstan. For us important to keep culture and traditions. My grandparents are Kazakhs from the Altai Mountains. They came to Turkey with other Kazakhs in 1945-1950. I am a close relative of Osman Batyr. My parents lived in Istanbul until 1991 and worked with European companies. Therefore, in 1990, we moved to Vienna. I have an older sister. My sister and I grew up in two languages — Kazakh and Turkish. In Vienna we were the only foreigners at school, so we had to learn German. Now we speak three languages: German, Kazakh and Turkish. After graduating from high school, I was admitted to the Academy of engineering, mechanical engineering, measurement and technologies control, computer science. Then I worked in different companies. I have been working for Siemens for 18 years. I started as a programmer, and since 2011 I am the General Manager of intralogistics projects all over the world. I have never forgotten my love for Kazakhstan. No matter how far we live from Kazakhstan, we will never forget where we are and who we are. We are proud to be Kazakhs. 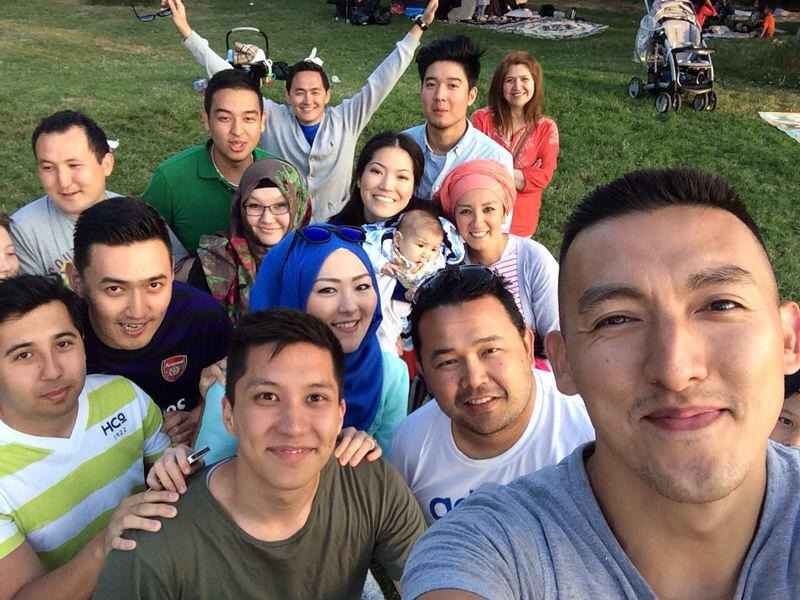 The first Kazakhs moved to Vienna in 1973, now the Kazakh diaspora has more than 35 families. In 2003, the Kazakh cultural Association of Austria, called Kasachische Kulturverein Österreich, was founded here. I have been the Secretary of this Association for five years since its Foundation. In 2010, the Kazakh cultural Association organized a large Kazakh Kurultai in Vienna. More than 1,000 guests came from all over the world. The last major event was Nauryz. It was almost as large-scale as in Kazakhstan. 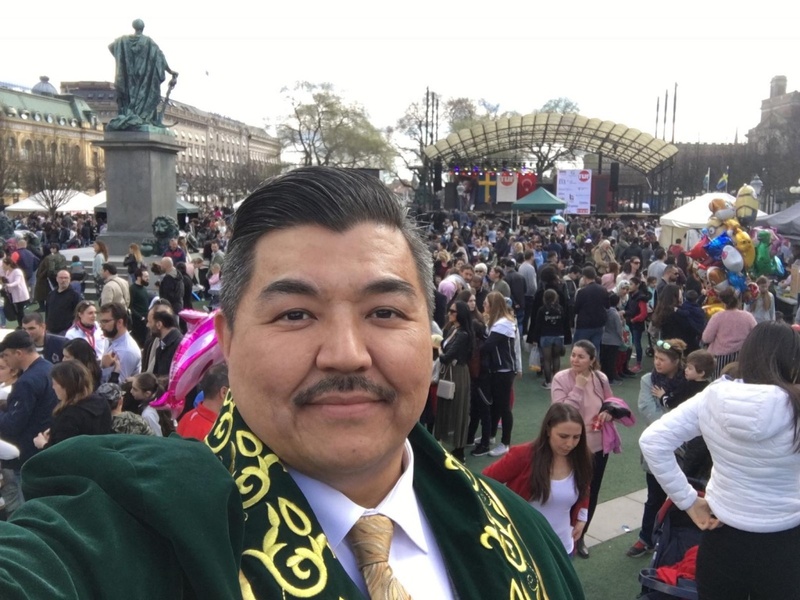 The Kazakh diaspora in Vienna is always in contact with each other. We organize many events. The diaspora closely communicates with the Embassy of Kazakhstan and Kazakh students who live in Austria. We help each other. 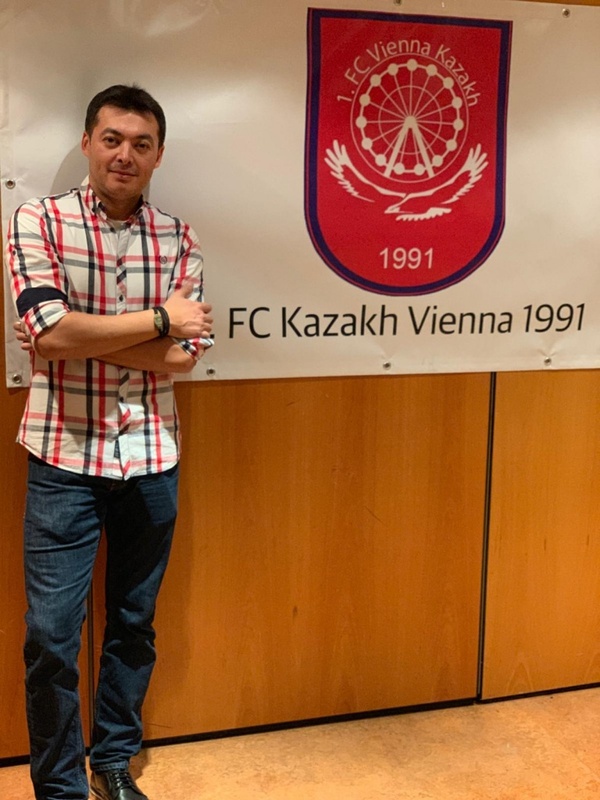 In 2017 official Kazakh football team called «1.FC Vienna Kazakh» was founded by youth in Vienna. This is the first official Kazakh football team in the Austrian League. I am the President and coach of our football team, now we have 38 players. Our team is the champion of the last European Kazakh Kurultai in Cologne in 2016. We also participated in tournaments in Kazakhstan. The purpose of our club is not only football and sports but also the integration of the Kazakh youth and learning of Kazakh language. 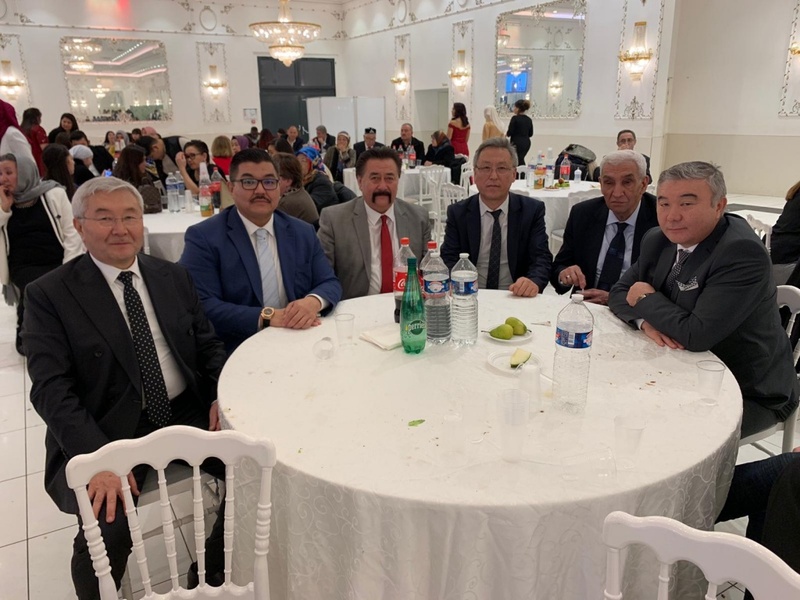 From 2018 I'm President of the Kazakh cultural Association in Austria and member of the European Kazakhstan Council, Advisor to the President of FEKA (Federation of the European Kazakh Association) and head of the Austrian FEKA Department. The organization represents Kazakhs who live in Austria and maintain official contacts with other organizations. We bring the Kazakh community closer to Austrian society. Our goal is to teach the Kazakh language, culture and traditions and transfer this knowledge to the next generation.